We liked it and put a (jump)ring on it. Saturn is immediately identifiable for it's beloved rings. 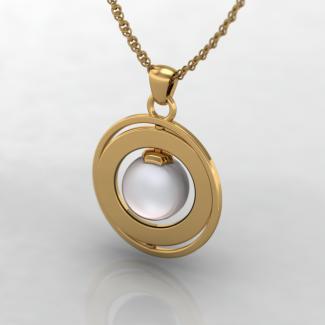 Our sixth planet is probably the most striking view to see in a telescope and inspired this Pearl Pendant with spinning rings on a Z axis. The Pearl cap is in a hexagon shape similar to the shape of the north pole of Saturn itself (google "Saturn Hexagon") is the only known storm with corners. We offer two variations of cultured pearls. Akoya Cultured Pearls set the standard of what people think of when they think "Pearl" (Or second thing if you watch Cartoon Network). Most Akoya producing mollusks are found along the coast of Japan. Completely natural pearls, which we do not offer, are "new car" expensive and very rare. The vast majority of Pearls are cultured which are made by placing a seed into a mollusk and coating the object with a layer of natural pearl. 99.9% of pearls are cultured and the exterior is made of exactly the same material as classic pearls. 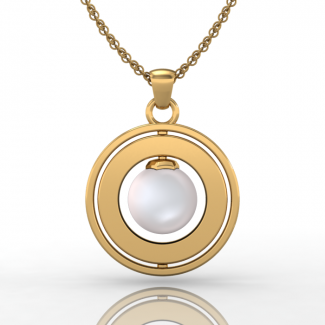 14K Yellow Gold pendant modeled after Saturn with a 7mm round cultured Pearl. We offer either "AA" White Akoya Cultured Pearls or White Freshwater Cultured Pearls. The chain offered is a 16" 2mm 14K Solid Yellow Gold necklace. The inner ring spins and the famous hexagon pole of Saturn can be seen on the cap. Don't forget the free shipping!